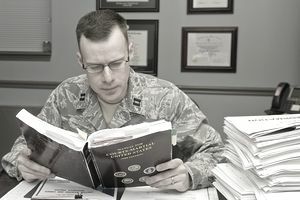 The military has its own laws and regulations, all of which can be found in the Uniform Code of Military Justice (UCMJ). When a service member breaks the rules seriously enough to require a legal hearing, the service member can request a court-martial and be tried by a jury consisting of military officers, warrant officers, or enlisted members depending upon the rank of the accused. Lesser offenses will typically be heard by the accused chain of command. A frequently asked question by recruits seeking to join the military is, "What is an Article 15?" If a military member gets into trouble for a minor offense and it does not require a judicial hearing, Article 15 of the UCMJ allows for the commanding officer to decide the innocence or guilt and administer the punishment to the offender if necessary. Also known as Non-Judicial Punishment (NJP), the Article 15 hearing allows for the immediate chain of command of the UCMJ offender to handle "in-house" the lesser offenses that do not require a trial or break other local or federal regulations. In the Navy, an Article 15 hearing is called Captain's Mast (or Admiral's Mast) depending upon the rank of the member's commanding officer. In the Marine Corps, it is called "Office Hours". In the Army and Air Force, it is referred to as simply an Article 15 hearing. If someone commits a punitive offense, an Article 15 proceeding is conducted. The offender can request a court-martial if they feel that it is worth the risk of a higher punishment. The Article 15 hearing is more of a legal proceeding than a trial that involves the chain of command with references speaking either for or against the accused. The commander will hear the Article 15 proceeding if the offense is too minor to warrant a full-blown court-martial. It's best to think of Article 15 as a misdemeanor court as opposed to a felony court (which would be more indicative of a court-martial). Below are the details of the Article 15 process. To initiate Article 15 action, a commander must have reason to believe that a member of their command has committed an offense under the UCMJ. Article 15 gives a commanding officer power to punish individuals for minor offenses. The term minor offense has been the cause of some concern in the administration of NJP. The Manual for Courts-Martial (MCM) indicates that the term "minor offense" means misconduct normally not more serious than that usually handled at summary court-martial (where the maximum punishment is thirty days' confinement). The Manual for Courts-Martial indicates that, in determining whether an offense is minor, the "nature of the offense" should be considered. In military criminal law, there are two basic types of misconduct: infractions and crimes. Disciplinary infractions are breaches of standards governing the routine functioning of society. Circumstances. The circumstances surrounding the commission of a disciplinary infraction are important to the determination of whether such an infraction is minor. When dealing with disciplinary infractions, the commander must be free to consider the impact of circumstances around the case. The commander's discretion in disposing of disciplinary infractions is much greater than his latitude in dealing with crimes. Except in the case of a person attached to or embarked in a vessel, an accused may demand a trial by court-martial in lieu of NJP. The key time factor in determining whether or not a person has the right to demand trial is the time of the imposition of the NJP and not the time of the commission of the offense. Prehearing. Nonjudicial punishment results from an investigation into unlawful conduct and a subsequent hearing to determine whether and to what extent an accused should be punished. Generally, when a complaint is filed with the commanding officer of an accused (or if that commander receives a report of investigation from a military law enforcement source), that commander is obligated to make an inquiry to determine the truth of the matter. If, after the preliminary inquiry, the commanding officer determines that disposition by NJP is appropriate, the commanding officer must inform the accused that NJP is being considered for the offense, along with the contemplated action, the suspected offense, government evidence, right to refuse NJP, and the right to confer with independent counsel. The maximum punishment in any Article 15 case is limited by the grade/status of the imposing officer as well as the rank of the accused. Whether the case takes place on shore or at sea also places limits on the punishment. Officer accused. If punishment is imposed by 0-4 or above, the adjudicating officer may simply reprimand the accused or place them on base or quarters restriction for a certain period of time. Forfeiture of pay, extra duty, reduction in grade, as well as confinement in a military jail, and even bread and water or decreased food rations. Reduction in food and water is rarely if ever, used any more. A person punished under article 15 may appeal the imposition of such punishment through proper channels to the appropriate appeal authority. There are only two grounds for appeal: the punishment was unjust or the punishment was disproportionate to the offense committed. Getting clemency after the fact is difficult to obtain from the convening authority, except for some deferment and waivers of pay to family members. Having an experienced military defense lawyer can help you post-trial by making sure any pre-trial agreements are not restrictive to clemency.